We are ready! Our first outdoor wedding and reception of the season will be held here at Pheasant Field Bed & Breakfast tomorrow. "Team Pheasant Field" worked really hard yesterday and today to make our grounds look great, to set up tables & chairs, decorate the tent, clean everything outside (did you ever scrub a pergola? ), and now - we are ready! Chris & Tammy will begin their "Happily Ever After" tomorrow, right here at the B&B. We wish them all the best! We are hosting some parents of a graduating Messiah College student and next weekend we will host Dickinson College parents for graduation. We wish those students well on the beginning of their new journey. Congratulations to the parents too! 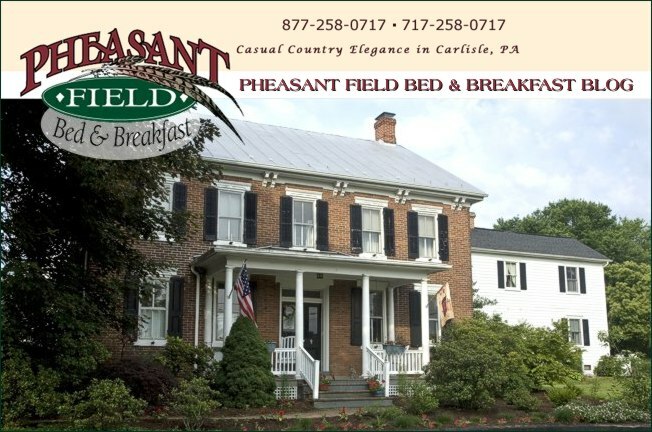 Whatever your reason for visiting Carlisle, come "home" to a Pennsylvania B&B - Pheasant Field Bed & Breakfast - a better way to stay!